Extermination: Extermination is really the wrong term for what we do. We perform wildlife management and removal. This most often means humane live wildlife trapping. We rarely resort to lethal methods of wildlife control. In fact, the only animal that we use lethal control means for is rats, because we've found that it's impractical and pretty much impossible to attempt live trapping, removal, and relocation for rats. Thus, we do in fact kill rats when we perform rat control services. However, it's very important to realize that there's a distinction between the services we offer and those of many other Orlando exterminating companies. Our company does not use poisons, ever. Poison control methods are very silly. In fact, they're very stupid. No animal, rats included, should be treated like insects. It's easy to use poison control methods for insects - it's pretty much the only way to get rid of termits, ants, cockroaches, and the like. However, it's a ridiculous approach to solving problems with vertebrates. First of all, I should mention that there's no legal and registered poisons that will handle 90% of the animals that we deal with - pretty much the only animal poisons out there are rodenticides - targeting rats and mice. Even if raccoon poison or squirrel poison did exist, it'd be an ineffective and inhumane approach to wildlife control. Look at the photos on the right. On the top, we see some dead rats. They died by eating poison left in the attic. The dead carcasses caused a terrible odor problem in the house, and new rats came in to the attic once these rats died. The problem was never solved by the poisoning attempts, so I was called in. I do the job correctly - I find the root of the problem - I identify all of the holes in the house that the rats can use to get inside the walls and attic, I permanently seal off all of those entry points, and I set dozens of rat traps throughout the attic. Because I physically trap and remove the rats, there's no odor, since I get those stinky dead rats out of the attic. The problem is solved permanently. The other Florida extermination companies do it wrong, because they just take a lazy approach. They simply throw some poison up in the attic, and they kill off some rats here and there, but never kill them all. New rats will keep coming and coming, and that's exactly what these pest control companies want. They want you as a customer forever. They want you to renew your monthly/quarterly pest control contract. If they solved the problem, they'd lose your repeat business! Our company does it the other way around. We don't want repeat business - we want to solve your problem 100% correctly and permanently the first time around. The up-front cost will be higher, but over time it will be much less expensive. But cost aside, don't you want your problem permanently solved in a week instead of over a course of several years or never? We specialize in all kinds of wildlife. Rats are the only animals that we kill. We'd rather not kill any animals, but at least the snap traps that we use kill instantly - a hard snap right over the neck. The use of poison is very inhumane. Almost all rodenticides are anticoagulants. The animal eats the poison and dies of internal bleeding - a slow and painful death. Plus, the poison might get eaten by a non-target animal. A squirrel or a raccoon might stumble upon it and eat it - or worse, a dog. Every person in my industry has seen such animals - they are in pain, their eyes are bloodshot, and they are bleeding internally - but the rat poison wasn't strong enough to fully kill them. Please don't just spread poison if you have an animal problem. 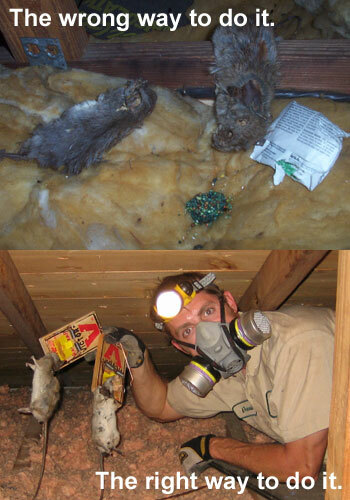 You can learn more by visiting the Orlando Exterminator of Rats site in Orlando FL. Oh, and this line the exterminator gives you about "oh yeah, the rat gets thirsty because of the poison and it goes outside to get a drink and it dies out there" - that's total bullcrap. You will never see such a claim posted on any rodenticide, because it's not true. It's the standard line that the lazy pest control man gives, but the fact of the matter is that the rat will die anywhere. If it happens to be in your house at the time of death, and there's a good chance that it will be, it'll rot and cause a huge odor. If you use poison control methods for your wild animal extermination, you're going to end up with a terrible odor in your house, a problem many people consider worse than living animals! Poison Doesn't Solve Your Animal Problem! If you've got a problem with a wild animal, such as a raccoon in the attic, an opossum in the trash can, a snake in the lenai, squirrels in the soffits or bats in the belfry, we will remove them the right way - the effective and humane way. We will trap the animals in humane live traps, and relocate them out of the area. They will not be harmed. We will address the root of the problem, and get your problem solved permanently, and it won't happen to you again. So when you need nuisance wildlife control for your wild animal problems, don't think Orlando exterminator, think 24/7 Wildlife - nuisance wildlife control specialists! We also provide rodent extermination services in these areas: Boca Raton Exterminator and Fort Lauderdale Exterminator and Palm Beach Exterminator for expert rodent control in southeast Florida.